The British motorcycle manufacturer Triumph and the leading Indian premium motorcycle manufacturer Bajaj signed a joint venture earlier this year. The two companies have finalized the plan and the bi-product of the JV has reached its concept stage. We are talking about the 500+cc motorcycle which will target directly at the mid-segment and will take Bajaj a segment higher than the Bajaj Dominar. Both the manufacturers feature a specific set of skills up their sleeve and are going to benefit from the same in the long run. 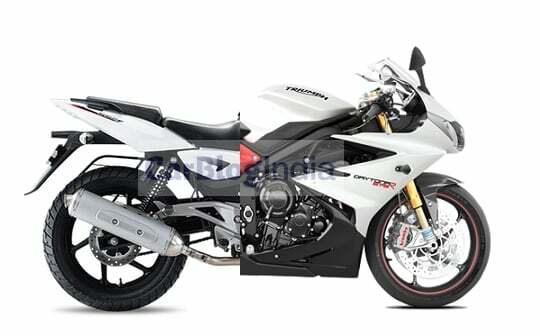 Triumph’s contributing in style, design, and engineering whereas its Indian partner will be offering a manufacturing base along with its speciality in design, manufacturing of low-cost motorcycles and supply chain. “If you come out with those things together, it is a very compelling proposition. We are certainly very excited about it and so is Bajaj,” Stroud said. Triumph is growing 20% in sales year over year with last year’s total sales number amounting to about 64,000 units, out of which, only 2% made it to India. With this collaboration, the British manufacturer is eyeing an opportunity to increase its sales in India exponentially amounting to over 1,00,000 sales annually. “The partnership with Bajaj will enable us to become a bigger brand within the country more quickly. You could be talking about a scenario where Triumph goes from selling 1,200 motorcycles today to volumes that are north of 1,00,000 units, which is a significant scale. That is the power of the opportunity,” said Stroud. Bajaj, on the other hand, will benefit from the engineering and technology provided by its partner to build a 500+cc bike and since KTM has no plans to introduce engines above 400cc, this will enable Bajaj in targeting the mid-segment which is currently ruled by Royal Enfield claiming 76% share followed by Bajaj-KTM at 21%. Stroud is non-committal on the specifics of the product and claims it is too early to release any info about the final product. Outside of this partnership, Triumph intends to assemble 90% of its portfolio in India by 2018 as it gathers up the momentum for the 500cc motorcycle. The British manufacturer has sold about 4,500 bikes in India since its arrival in 2013 with the Tiger series amounting to a majority of sales and introducing an all-new segment of the motorcycle in the nation. The company has overtaken Harley Davidson in terms of local market share and is keen to invest further as it eyes an opportunity in the Indian market.